A digital model of the human buttocks engineered at the university is set to bring new levels of comfort to office workers and wheelchair users. Masters student Sarah Cox, from the Faculty of Engineering’s Bioengineering Institute, is using advanced computer and mathematical modelling techniques to create anatomically correct virtual buttocks. Formway, a New Zealand-based office furniture company, approached the university looking for scientific input into chair design. “The goal is for Formway to have a virtual model of the buttocks to use each time it designs a new chair to predict how the muscles will react,” Miss Cox said. 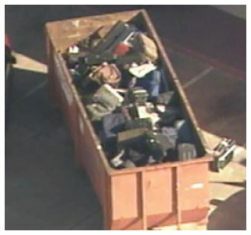 Authorities are trying to figure out how dozens of pieces of luggage belonging to international air travelers ended up in a trash bin behind a Houston [Texas] pet store. FBI Special Agent Rolando Munoz said 68 pieces of luggage from various international flights were discovered. He said the luggage was turned over to Continental Airlines to sort out. Harris County sheriff’s deputies said the luggage belonged to people who flew internationally on Continental, Lufthansa, British Airways and US Airways, Houston TV station KPRC reported. Sgt. Dana Wolfe, a spokeswoman for the Harris County Sheriff’s Office, which first responded to the luggage report, said tags on the bags showed some of the travelers were going to or from London and Dubai. Continental spokeswoman Mary Clark didn’t know if the contents of the bags were stolen. She said the airline would investigate along with law enforcement authorities. Don’t know whether to cheer for him or yell at him. Yell, I think. Peter Davies, who is half blind, was banned from the road last month after neighbours sent a petition to the DVLA saying he was too dangerous behind a wheel. While learning to drive he crashed into a fence, mounted a pavement and parked two feet from the kerb. 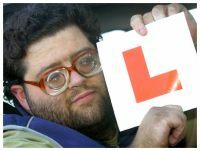 After an eye test he was told he was not eligible to drive. Pete’s family in Burry Port, near Swansea chipped together to buy him a £300 pair of special glasses for Christmas. According to the Mirror he said: “They have made all the difference. My last glasses were like bottle tops and so heavy they slipped down. But not these. December 27, 2006 Posted by oldstersview | Uncategorized	| Comments Off on Don’t know whether to cheer for him or yell at him. Yell, I think.